James & I both took a mental health day yesterday. What that means for James was that he just stayed in his room zoning out (no tv), playing with Lego & in the afternoon he even had a sleep. What it means for me is taking things slowly, not worrying if the laundry is running 2 days behind schedule, the dishes aren't washed & dinner isn't in the crock pot. It also meant time to just wander around the garden on a nice sunny day & take stock of what is good in life & what makes me happy in the garden. 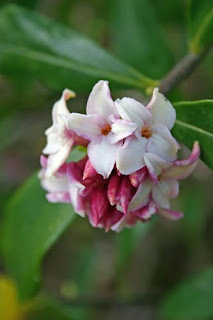 At the moment the Daphne bush is in full bloom & the scent always puts a smile on my dile.